Dr Seuss introduces the youngest children to the concept of sight and seeing, looking at a range of everyday things from colours and cutlery to socks and underpants. 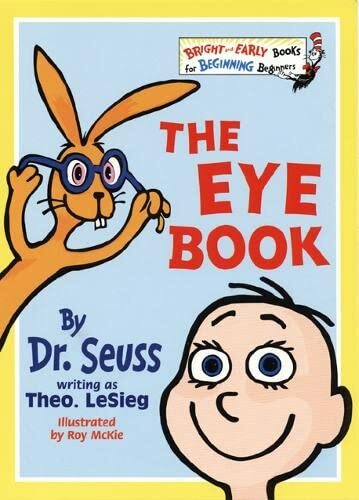 In this delightful book, Dr. Seuss introduces the youngest children to the concept of sight and seeing, looking at a range of everyday things from colours and cutlery to socks and underpants! This title belongs to Dr. Seuss's Bright and Early Beginner Book series, designed especially for "Beginning Beginners" -- preschool children on the threshhold of learning to read. Using an exuberant combination of bright, bold pictures and rhythmic rhyme, Dr. Seuss introduces simple stories and concepts, adding a large helping of zany humour to help the youngest child make the all important connection between word and picture. Originally published under the pseudonym of Theo. LeSieg, The Eye Book is being relaunched with a stylish new cover design which reveals, for the first time, the true identity of the author -- Dr. Seuss himself!